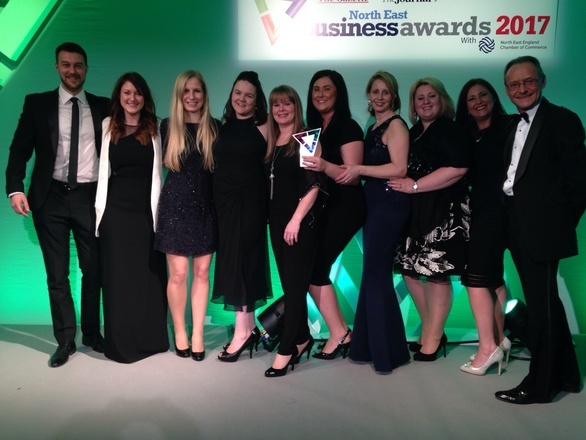 We are delighted to announce we have won the Heart of the Community Award for the Tyneside and Northumberland region at the North East Business Awards 2017 for the fourth time! This award recognises our extensive corporate responsibility programme and our contribution to the overall well-being of the community, its environment and general quality of life. We are delighted to have won this award again and it reflects the achievements and commitment by our people to our community. The award was presented to us by Matt Boyle of Sevcon, who said that we clearly put corporate responsibility at the centre of all we do and ‘exemplified a business that was committed to giving back to the region’. Charitable fund – 1% of our annual profits is used to make grants to local charities and we’ve donated over £500,000 since the fund began. Pro bono – In the last 12 months we’ve provided over £70,000 in free legal services. Volunteering – everyone is entitled to two days paid leave a year to volunteer and over 30% of our people regularly help local causes. Inspiring careers programme – working with schools in disadvantaged areas to give young people an opportunity to experience life in a law firm. Green team – we constantly evaluate our business practices to make sure we’re operating in the most environmentally responsible way. Read more on how we are being a responsible business. Hugh Welch, Senior Partner, said: “Through our community work we are privileged to meet so many inspirational people who are either investing almost all their energy in helping others or who are striving to overcome adversity. “I’m incredibly proud of the many people here at Muckle who also devote a tremendous amount personal time, expertise and energy to helping some fantastic causes, from scout and sports groups to local mainstream charities and the environment. Best of luck to all the companies attending the Durham, Sunderland & South Tyneside ceremony on 16 March and the Teesside regional awards on 30 March. We will hope to see many of you at the North East Business Awards Grand Final on 27 April, 2017 at Hardwick Hall Hotel, Sedgefield. For more information on our community activities please contact Hugh Welch.